Perfect for that warm lighting, even during the evenings. Bringing the virtual into reality. Indian weddings just neeed marigold or gendha-phool decor! Incorporate them in your wedding photobooth in creative ways. Even a flower wall! You can decorate a photobooth with cloth or paper drapes in any style or colour you want. Match it with your wedding theme! Another wedding photobooth idea that is too pretty and perfect for a fun, happy vibe. 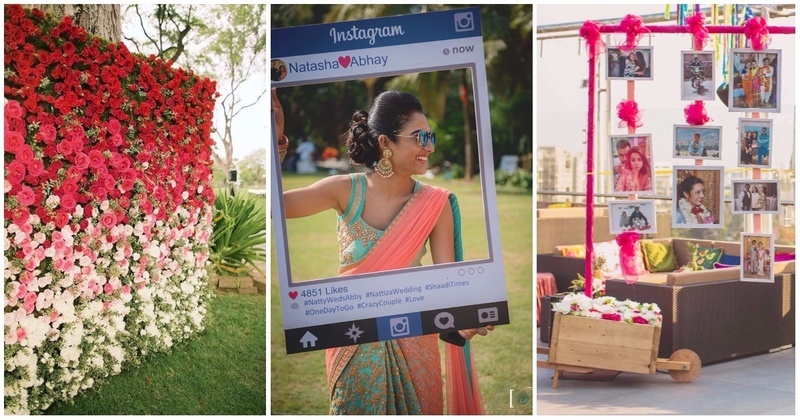 Personalise your Indian wedding photobooth by decorating it with cute polaroids! Love these hearts! So cute and so simple - all you need is some time to cut-paste! Or just pay your brother to do it for you. I’m totally using this heart balloon design for my own wedding! But if you want to skip the extra effort, a random bunch of balloons look really cute too! Another pretty photobooth idea with lights. Perfect for evening weddings!